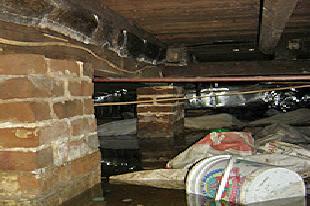 A wet crawl space can lead to a variety of health and safety problems in your home. These can Include mold growth, rotted floor joists and pest invasions. The best way to avoid the headaches caused by these problems is to dry out and seal your crawl space, which can be done in four steps. 1) Stop water from entering the crawl space. Inspect your crawl space foundation for cracks to see if they're the water source. If you find any foundation cracks, call a professional, since those could be a sign of a structural problem. Repair any leaks and insulate cold water pipes (this will prevent condensation). 2) Dry out the crawl space by removing the moisture source and puddles. Check grading, drainage and gutters to make sure they're not contributing to your wet crawl space. 3) Clean-up the crawl space. Replace wet insulation. Remove debris. Scrub mold off of any surfaces. Now, this is a job that's typically best left to the professionals since various safety precautions need to be put in place before and during mold removal. Beware of rodent infestations. Rodent droppings can contain harmful bacteria and viruses. If there's asbestos, call in a professional! 4) Keep moisture out of your crawl space by encapsulating Install a sump pump to remove any excess moisture, if needed. Lay a thick, 20mil vapor barrier, like Clean Space, over the floor and up the wall. Do not cover the vapor barrier with gravel or dirt, it will prevent you from seeing if any new puddles form from a plumbing leak. Install an energy-efficient crawl space dehumidifier to keep the space dry. Condition the crawl space air.